Why do we get tears when we are sad, in pain or have an eye irritation? Do you know how tears are produced? Here, we shall shed some light on the mechanism of human tear ducts. It is fascinating how tear ducts work, whose sole reason is to carry tears. They carry tears, secreted by the lacrimal glands (located beneath your upper eyelids) on to the surface of eyes and from the tear sac (located by the side of the nose) into the back of throat. Blinking of the eyelids forces the tears into the small openings, punctum, located at the corner of the eyes (near the nose), the canaliculus and then flows into the lacrimal sac. The tear (lacrimal) sac connects to the nasal cavity with the nasolacrimal duct. In this way these ducts conjoins the eyes to the nose and keeps your eyes clean by draining the tears. This is why you often get the taste of your eye drops. They are used under your eyelids, but, trickle down the throat as both of these organs are indirectly connected by ducts. On an average, up to 1.1 g of tears are produced daily. As you grow older, the amount of tears secreted will gradually reduce. These ducts are very integral for eye care as tears help keep eyes safe from dust particles and prevent dry eyes. You must note that tear or nasolacrimal ducts do not produce tears! Human tears are known to be rich in potassium giving a salty taste. They also contain a special enzyme called lysozyme that helps wipe out bacteria from the eye and keeps your eyes lubricated. However, tears shed from getting overwhelmed with emotions contain prolactin and adrenocorticotropic hormone which contain protein. Human tears also made up of leucine enkephalin, a natural anodyne. 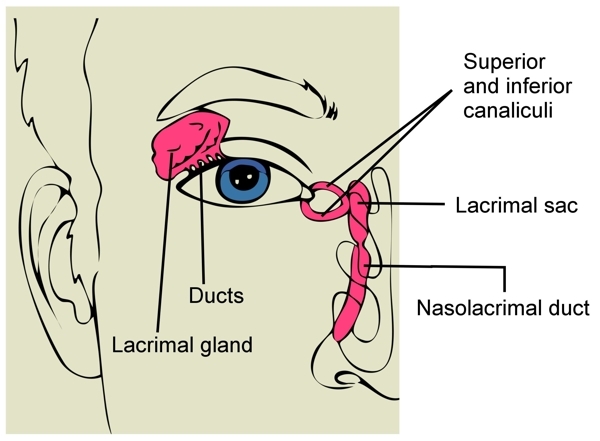 There are four human canaliculi ducts that are thin canals located in the upper lid and lower lid of each eye and connect to the tear glands. They help drain tears as they flow through the punctum, tiny openings also located in the bottom inner corner of each eye. When tear glands activate, they produce tears and pass them on to these ducts. The ducts help flush them out of your eye. In the absence of these ducts, your eye will keep flowing with tears. They help discharge tears through nasal cavity. This explains why your eyes constantly water when you have an eye infection that blocks your ducts. Overflowing of tears, epiphora, can lead them to flow in to your nose and mix with the mucus, causing a running nose. We are all born with tear ducts that open by the time we are born. However, around 6% babies are born with closed or blocked ducts. This syndrome is called congenital nasolacrimal duct obstruction. Tear gland keep producing and releasing tears in small quantities continuously. These tears are passed between the upper eyelid and the tear duct to carry through the tear duct and ultimately, drain in to the nasal cavity. When you blink, the tear spreads across the eyeball creating a thin tear film. When tear or lacrimal glands are over-activated, due to various reasons, they work over-time and produce too much quantity of tears for the nasolacrimal ducts to contain. Hence, they start flowing from your eye-ball. The protective tear film is continuously replenished and the eye is lubricated as you blink. The tear glands keep replacing the secretions in this film over your cornea with new tears. It is secreted out through the punctum in to your ducts and, then, into the nose. The nose secrets them in its fluids. When you wake up, there is mucus like substance called rheum accumulated in the inner corners of your eyes. This is the dirt and dust cleared out from the cornea's surface throughout the day. When do Tear Ducts Work? There are three types situations when these ducts are called upon to carry tears. When you get a speckle of dust or eyelash into your eye, your eyes start tearing up. This is the tear duct's natural mechanism to remove the foreign substance irritating the eye. Causes of reflex tears are onion vapors, spices like chili or pepper, contact lens and tear gas. Reflex tears are also produced when you throw up, yawn or see bright light. You may have noticed, sometimes your eye becomes moist or watery for no specific reason. This is the natural lubricating phenomenon for a regular clean up. Tear glands regularly produce basal tears to keep your eyes clean and free of dust and dirt. These tears are antibacterial in nature and contain lysozyme. The chemical fights certain bacteria on the topmost layer of the tear film, called peptidoglycan. Basal tears are high in salt content, resembling that in plasma found in blood. When you are sad or experience strong emotions, they are a lot of chemical changes that take place in your brain, at a high rate. This activates tear glands, or lacrimal glands beneath the eyelids and builds up tears in the ducts. Also, there is a sudden rush of blood to your face and further stimulates the production of tears. When your ducts are unable to hold the amount of tears, they flow from the opening located in your inner eye. Crying tears are produced generally due to sadness, pain, anger or extreme happiness. They are different from the other two types because you will sob when you shed crying tears. Tears also contain sodium which can give you swollen eyes when you cry a lot. If you can't cry, it may indicate that your tear duct is blocked and this can cause infections. Clogged or blocked ducts are a result of malfunctioning of the thin connective tissue that helps the ducts to open and close. It can lead to dry eye syndrome. Tear drainage system is then probed with the help of a thin, blunt metal wire which is inserted at punctum and then pushed into the nose to ensure the path is not obstructed. If this fails then plastic or silicone tubes are placed, under anesthesia, in the tear drainage system. In some cases, surgery is required to create new tear drainage channel through nose bone to bypass the problematic (natural) one and clear the problem.